Many people enjoy spending summers on their boat and a lot of boats come equipped with battery switches. However, not everyone completely understands what the purpose of these switches are. They do not see the value behind them, and even if your boat does not have one, you may want to consider installing one. 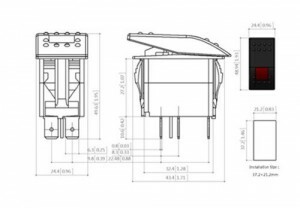 What is a Marine Battery Switch? These switches transfer batteries without reconnecting your wires each time you drain one battery. 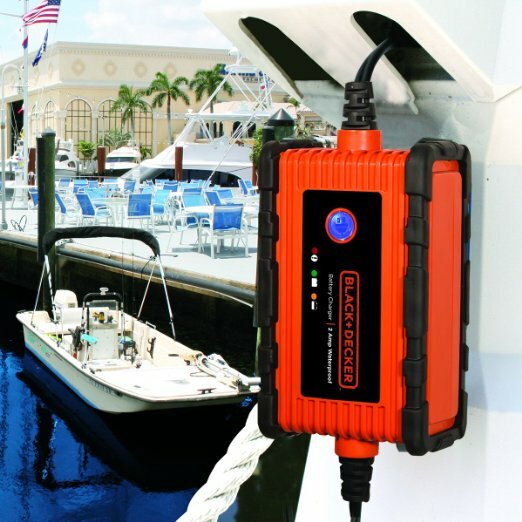 This is very useful in keeping the battery that you run your boat with, fully charged while out on the water, especially if you have a lot of battery powered items on board your boat. These items may include a radio, lights, fish finders, trolling motors among other items. 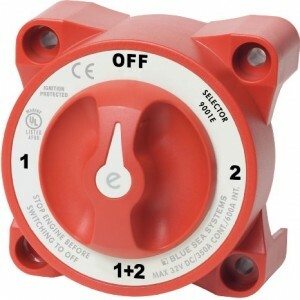 All boaters could benefit from using a battery isolator switch, even if there are only some boats that require them. If your boat has one battery on it, you will have a single battery that handles everything. However, this battery will only be charging while the motor is running. Once you turn off the engine, the alternator will stop charging and then your lights, radios, and other equipment will put a steady pull on that battery. When the day is done and you are ready to head back to shore, that single battery may be dead which will leave you calling for help. If it cannot start, the alternator will not charge. Therefore, many boats, especially house boats, now have two batteries in place at all times and they have a switch that runs between them. Some items may be controlled off of both batteries at one time, but others can be used separately based on what you need. This switch allows you to use one battery over another for running your boat, while another battery may run electronics while the boat is not running. Some battery switches have an area that says both. It is important to keep in mind that both does not necessarily mean you are working both batteries equally. The way your alternator is designed is to recharge a battery. If you have your boat battery switch set for both, your alternator will choose less work and simply keep a charge going to the fullest battery. In the end, choosing both could still leave you yelling for help…. How Can Battery Switches Prolong the Life of Your Battery? It may seem like a strange concept that if you simply set it to pull from one battery to the other you will add battery life, but it is true. You simply need to learn how to use the battery switch properly, which means trading off your battery usage. Consider for a moment what happens if a battery sits too long without charging. Batteries are made with materials inside of them that will hold a charge, such as lead sulfate or battery acid. When you leave a battery without a charge, eventually, the material inside will harden. As it hardens, it will become more difficult to charge and it will hold the charge for less amount of time. If you have a switch in place on your boat and you swap from using one battery to the other on a regular basis, some people recommend basing it on odd or even days, one battery will never end up fully discharged. This is great because batteries lose power every time that they are completely drained. This often leaves people searching for a marine battery charger. If your boat does not have a switch in place, but you feel that you are running too many gadgets on your single battery or consistently find yourself replacing batteries that no longer stay charged; it may be time to have a switch put into place. Doing so will save you a lot of trouble, money, and preserve your sanity. 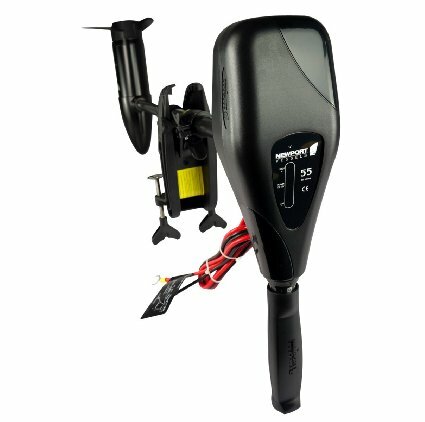 Below are a few options of some of the most popular boat battery switches available. 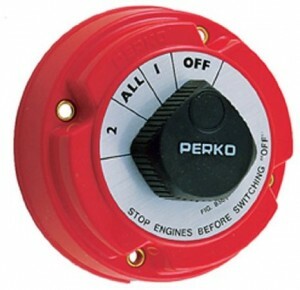 The Perko battery switch is usable for boats with two or more batteries. You can use it with dual or single systems. Its primary job is to permit you to select which battery you want to use for starting and charging or the operation of your other devices. It can also allow you to use both batteries in parallel as long as your system uses batteries that are under 50 volts capacity or 250 amp continuous and 360 amp intermittently. Use it by simply turning to dial between 2, All, 1, and off. If you need continuous power outputs and reliability, this switch could be the perfect choice for you. You can even switch between battery banks without experiencing any power interruption, regardless of whether you choose 1, 2, or both. It can be used on gasoline powered boats and it is easy to install thanks to its ignition protection system. You can mount it on any surface or on a panel. 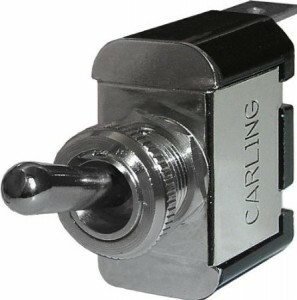 This waterproof toggle switch is made of nickel plated brass and a phenolic non corrosive construction. It can withstand submersion in water for up to 30 minutes. It is rated for 250V AC 10 amps, 125V 15 amps, 12V DC 15 amps, and a terminal size of 0.25”. It can be used as a toggle switch for anything, including use as a battery switch on your boat. 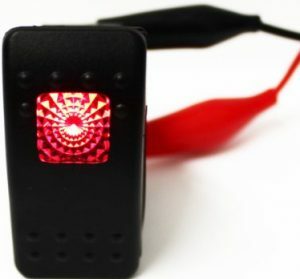 This waterproof rocker switch is a 12V or 24V waterproof switch. It is a three terminal switch. It can control household items, and more with ease and shows an LED light to let you know that it is working properly. The only downside is that you will have to ground each of your major appliances on a separate ground wire than the one that controls the LED light. 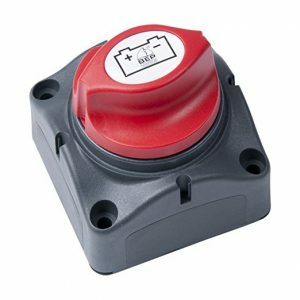 One of the most popular choices for a battery switch is the BEP Brand by Marinco. Marinco offers a simple on/off switch, but there are others available if you require a more sophisticated setup. It has a rating of 275A DC continuous for one hour, a 455A DC intermittent for 5 minutes, and a 1250A DC cranking, which lasts for 10 seconds. The voltage requirement is 48V DC. It has a stud size of 2×3/8” or 10mm. A locking system allows it to be a stand-alone unit, or you can link it to other switches. You can even remove the control knob. It has tin plated copper studs and nuts. There are also three removable side plates that gives you access to its cables and a rear cover that insulates the unit so you can worry less about short circuits. This also means that it meets ABYC requirements. Owners have given it a 4.6-star rating, which is higher than most all other marine switches. Most say that it is an excellent choice for anyone who wants a heavy-duty switch that is weather proof and ideal just about any application. Popular uses are on RVs, boat trailers, camping, and more. Most like that it blends in and looks like something that was originally meant to be there and not something they pieced together. It can completely kill the drain on a battery when it is not being used.